Ifjúsági találkozó Clevelandban / Youth Conference in Cleveland, May 25-27, 2012. Please click here and advance to page 5,6, 8. & 9. A chicagói ifjúsági találkozón (2006. május 27-én) megválasztottátok Gerstner Kornélt az ifi szöv elnökének, egy évre. Keressük a módját annak, hogyan tehetnénk hasznosabbá, érdekesebbé számotokra ezt a web oldalt. Nem csoda, ha a lap szerkesztőjének nem sikerül - nem a ti korosztályotokból való. De szívesen adnánk helyet a ti munkátoknak is. Vagy hozzatok létre magatoknak egy internetes oldalt, mi, öregebbek nem vesszük azt sem rossz néven. Abban az esetben ezt az oldalt lényegesen leszűkitenénk, s hozzátok irányítanánk olvasóinkat. Kornélt szívesen veszi gondolataitokat. Írjátok meg neki. A chicagói találkozóról egyébként nem küldtetek élménybeszámolókat. Még megtehetitek, a következő szám 2 hét múlva készül. Addig várom írásaitokat. Fényképem van, bár jó képet mindig szívesen fogadok. 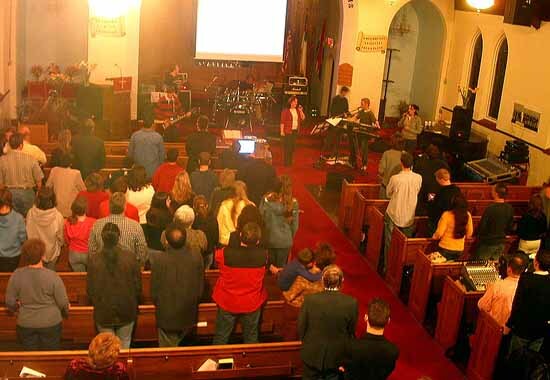 2005 októberében az Észak Amerikai Magyar Baptisták New Yorkban ifjusági találkozóra jöttek össze. A szövetségnek az akkori alelnöke, Gerstner Kornél, röviden, de határozottan felhozott egy ötletet, amiről szó volt korábbi magyarországi utazása során. 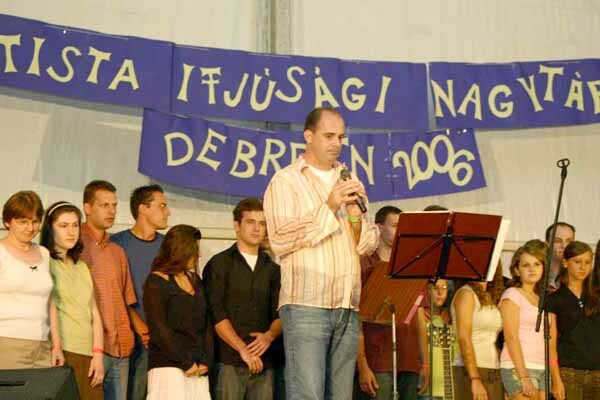 A Magyar Baptista Ifjusági Szövetséggel, pontosabban annak elnökével, Durkó Istvánnal találkozott, és szóba jött, hogy 2006 nyarán közvetlen a MABAVIT III. előtt kellene tartani egy nemzetközi Magyar Baptista Ifjusági Nagytábort. Nem szabad mindenkinek a nevében beszélnem, de személyesen akkor a New York-i imaház egyik padjában ülve, magamban azt gondoltam, hogy jó lenne, de biztos nehéz lenne megszervezni és összehozni, lehet, hogy nem lesz belőle semmi. De lett! Vasárnap délutántól péntek délig folyamatosan érkeztek ujabb és ujabb résztvevők a Debrecen közelében levő Dorcas Centerbe. Talán 700-an is voltunk egy-egy ponton a hét folyamán. Isten megáldott minden egyes résztvevőt, volt sok alkalom az egymással való találkozásra, de arra is megadott minden lehetőséget, hogy Őhozzá is közelebb kerüljünk valamennyien. Többek között Szenczy Sándor, Tóth Sándor, Veres Efraim, Durkó István, és Dan László hirdették az igét a fiatalok között. Napi két vagy három alkalma volt mindenkinek, hogy akár a zenén, az áhítaton, a csoportos beszélgetéseken, vagy éppen egy igehirdetés által nyerjen lelki kincseket. Többen ott fogadták el az Úr Jézus Krisztust, mint személyes megváltójukat, voltak, akik közelebb kerülhettek Hozzá. Ha hisszük, hogy az imának van ereje, akkor szeretnék egy imatémát ajánlani az olvasóknak. Előreláthatólag 2007 nyarán a Rámai Táborban egy két hetes ifjúsági tábor lesz összehozva, amire Magyarországról fiatalok meg lesznek, sőt már meg is vannak híva. Természetesen nem 700 fiatalról van szó, lehet, hogy 100-ról sem, de a fontos az, hogy azok, akik majd részt vesznek, érezzék Isten jelenlétét és hogy a vendégeknek maradjanak majd olyan emlékeik, mint amilyenek a Debreceni Nagytáborból maradtak minden észak-amerikai fiatalnak, aki ott lehetett. What a weekend with showers of blessings. God always amazes me! Thank you Detroit church for helping us and giving so sacrificially! This weekend was a team work, and each of you was a crucial team member. Thanks for this unforgettable weekend! 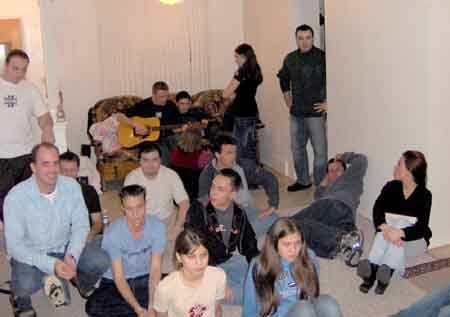 Detroit has become the favorite hotspot for the North American Hungarian Baptist Youth. 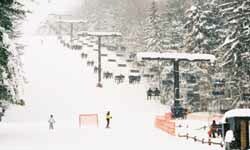 About 40 of us flocked in on the weekend of Feb. 5-6 for a ski trip. We visited many of Detroit's major attractions that offered lots of fun. Among them was the Pap's family house where we all stayed and enjoyed lovely hospitality and boarding for the weekend. Every room served as a bedroom; the living room also served as our lounge, featuring movies, games, and even devotion consisting of preaching, praying, singing, and conversation. Saturday morning we went to the Alpine Valley Resort to hit the slopes and enjoy sliding down the hillside on skis, snowboards, snowshoes, and even on our faces in some cases. It was wholesome fun to make it all the way down without falling, but some major falling stunts turned out to be even more entertaining. 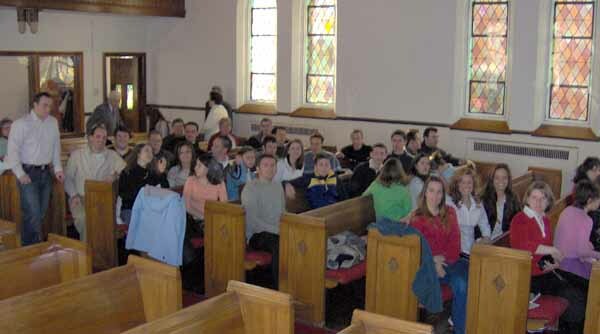 On Sunday we drove to Detroit's next major attraction, The First Hungarian Baptist Church, where we shared in blessings through a short service and delicious Hungarian-American food that was followed by a good two-hour workout at the ice skating rink. There we discovered that we are by no means figure skaters; lucky for many of us the ice didn't break underneath us. When we concluded our little encounter with the ice rink, we were just a short drive away from our final destination of the weekend getaway and get together: the projection screen in the Miko family's living room. Reporters and bulky football players were projected on the screen in the midst of trainers, strategists, cheerleaders, officials, and fans as they excitedly prepared for the big game. The excitement in the living room spilled out into the kitchen and down to the basement where long tables were packed with trays of appetizers, food, and snacks for the fans and spectators. The basement also featured a ping-pong table that had drawn many of us around it to break us into a sweat. Have you ever failed while attempting to do something? Did you try again? Did you settle in hopeless defeat? Perhaps, if you're like me there have been examples of both situations in your life. The question is what made the difference between the two scenarios? 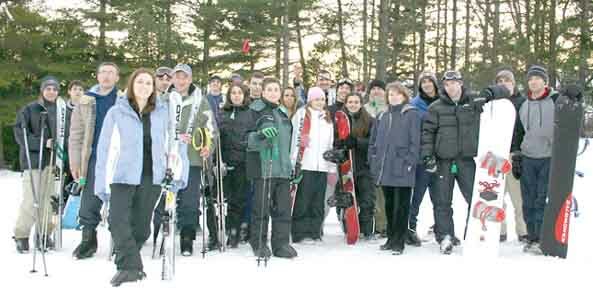 As youth from Cleveland, Chicago, New York, Florida and California gathered together for a well-planned ski trip in Detroit on February 4th to the 7th there were plenty of opportunities to see God address these issues. The focus was a crucial one: FAITH. A ski slope may have looked intimidating to the first-timers, understandably so, for some things we fear in life have real potential for hurt. Falling can be painful on our bodies and emotions. Brokenness may require serious time out for healing. If you were to watch these first time skiers step out on the glistening snow you would have noticed three commonalities they shared. First of all, they had a made up their mind to try. Sometimes we want God to help us stay the way we are. But these kids grabbed a handful of faith and were on their way to change. Change leads to growth, and the first faith step is a made-up mind in Christ. Our minds really are the battlefields! Second, they realized that doing something fairly scary for the first time would not only be easier, but even enjoyable if they took the outstretched arm of one who was already a skilled skier. This took a certain amount of humility. It was necessary to admit that they needed help. Moving a mountain or getting a skier down that mountain safely is nothing compared to changing our selfish, proud, ambitious and destructive hearts. To take another's arm also took faith in that person. Will they catch me when I fall? Will they have the patience if I can't do this even an hour from now? Will they ridicule me and expose my weaknesses in front of others? Will they ever help me with anything again after this? These are questions we never need to worry about when it comes to Jesus! The reason we can have faith in Him is because His character is that of faithfulness. Not our character, not that of the noblest Christian we know, but the character of Christ. He is faithful always and in everything. It is because of His faithfulness we can resist the temptation to measure ourselves against people who seem more gifted for example. Over and over Jesus tells us "You can trust Me!" Thirdly, when they fell they got up again! If you have ever been in a trial you may be all too familiar with how much effort it sometimes takes just to lift your head and look up, let alone to move your entire being in the right direction. We must possess the faith to get up again, and again, and again. But where and how do we get this faith? At times it feels as if God is demanding it of us. Is there a clear-cut path to being faith-filled? Yes! The Bible tells us that faith comes by hearing and hearing by the word of God (Rom. 10:17). It is also a gift of God that is freely ours (1 Cor. 12:9). Faith grows much like a muscle --it must be tested against resistance. Jesus says we have enough faith if we believe in Him (Matt. 17:20), so there goes that excuse! The object of faith is Christ (John 6:28-29), not anything else. 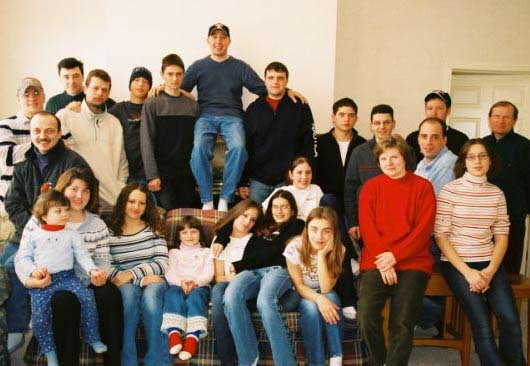 The weekend of February 4th, 2005, the young people of our Hungarian Baptist Churches met in Detroit, Michigan for a ski weekend. We came from New York, Chicago, Cleveland, California, and even Florida. We were graciously hosted by the Papp and Miko families and the Detroit church. They provided us with delicious meals and places to sleep and socialize. We managed to pack quite a bit into our short but wonderful weekend together. Our activities included skiing, snowboarding, ice skating, and a super bowl party. Some of us bravely tried these sports for the first time! The weekend in Detroit was a great experience for me. There was something interesting done every day. On Friday there was bowling, on Saturday there was skiing, on Sunday there was church, ice-skating, and the Super Bowl Party. But sadly, on Monday, there were goodbyes to friends. The thing I would like to write about would be the skiing. Saturday was sunny, bright and about 50 degrees. At first, everything was going well for me. I was on the "bunny slopes" (the easiest slopes there), and I was having a great time. But after lunch I decided to try a more hmmmm, how should I say, challenging slope. When I got to the top, at first, I was so scared I thought I would stay on the mountaintop until closing time. But I gathered up the little courage I had and skied down, down, and down. I fell once the first time down, and if you know anything about skiing, you know how difficult it is (it's difficult for me anyways) to stand up and not continue skiing down the mountain. That first time, I ended up squatting/skiing down the mountain and looked very foolish. I tried going down again, and this time fell down twice. By this time I was very frustrated about why I couldn't ski down a slope. I skied down again, but it was no better. I decided to give up, but then, my guardian angel came wearing a yellow and black jacket. Good old Korry. He persuaded me to go up once again, but this time he would be helping me. Well, he tried explaining the basics of braking to me, and I thought I was doing it right, but I fell down the mountain three times and the last fall being very painful. Now I was definitely going to give up, no matter what anyone said or did to me. But when Korry wants to help, you know he won't give up, so I agreed to go down the mountain one... last... time... And this time, I listened to Korry and learned how to brake, and I didn't fall down once! I was very happy, and I had a great time for the rest of the day. But the important lesson I learned was this: I didn't actually believe Korry until I was ready to give up. Nagyon örültem, amikor megtudtam, hogy részt vehetek a Detroiti síelésen, melyre február 4-től l 7-ig került sor. Legnagyobb élményem az volt, hogy annyi fiatal közt tölthettem el a hétvégét. Mindenhol és mindenben együtt voltunk, együtt tölthettünk minden percet - teljes szívemből vágytam erre az egységre. A péntek estét énekléssel és bibliatanulmányozással töltöttük el. A hit volt az egész hétvégének a témája. Gestner Kornél elmondta a fiataloknak, hogy az imádság nagy hitet igényel. Ez nagyon megérintett engem, mert valóban nagy hit kell ahhoz, hogy mi, mai fiatalok kitartsunk az imádságban, még akkor is, ha nem kapunk rögtön választ, vagy nem látunk semmi eredményt. Az Úr arra tanított engem, hogy legyek erősebb hitemben, mert Ő meghallgat engem, de nekem hinnem kell, hogy ezt igazán megteszi. Az Úr Jeremiás 33:3-ban azt mondja, hogy: "Kiálts hozzám, és megfelelek, és nagy dolgokat mondok néked, és megfoghatatlanokat, amelyeket nem tudsz." Milyen csodálatos, hogy Isten, aki ezt az egész világot teremtette, ilyen közel van hozzánk és megáld minket, ha hiszünk. Áldás volt Stejanko Eric jelenléte is közöttünk, akit felhasznált az Úr a fiatalokhoz intézett beszédében. Ő arról szólt, hogy hittel tegyük le minden aggodalmunkat az Úr elé, mert csak így nyilvánulhat meg az Isten akarata a mi életünkben. Engem például azzal is megáldott az Úr ezen a hétvégén, hogy hinni tudtam abban, hogy meg fogok tanulni snowboardozni, legalább egy kicsit. Isten segítsége által ez meg is történt. Igaz, sokszor elestem, de soha nem adtam fel, hanem felálltam és újból kezdetem az egészet. Az Úr nagyon megáldott minket, fiatalokat és persze vezetőinket is, akik az egész hétvégét szervezték. Köszönjü azoknak a családoknak és a detroiti gyülekezetnek, hogy fogadtak bennünket és gondoskodtak rólunk az egész hétvégén. Szeretném, ha még sok ilyen ifjúsági találkozónk lenne a jövőben is, mely még jobban elmélyítené az egységet közöttünk. DETROITI IFJÚSÁGI TALÁLKOZÓ 2004. november 13-14. A szerkesztő várja a fiatalok írásait a találkozóval kapcsolatban. Szolgálattevők: jobb oldalt a két zenekar, majd Gerstner Kornél, Dan László, Lukács János, Kulcsár Attila, (nem látható:) Pardi Félix, Mikó István és a helyi lelkipásztor. Január utolsó hétvége sokak által ismert terveknek adott lehetÅséget. Öt gyülekezetbõl 25 fiatal vett részt a hétvégi sítúrán, a New York államban levõ Peek'n Peak rezervátumban. Gyönyörû hely, rengeteg hó, síelésre alkalmas idõ volt. Szállásra három lakrészt béreltünk 3-3 szobával, konyhával és hangulatos kandallós társalgóval (ahol az áhítatokat tartottuk). Volt aki már péntek délután kipróbálta a sípályát, mások szombat reggel "gyakoroltak". Többen voltak, akik felbátorodva, elõször kötöttek sílécet a lábukra. Estére mindannyian profik voltunk saját kategóriánkban, különösebb baleset nélkül. Kicsit szögletesedett ugyan a fejünk a sok eséstõl, de Istennek legyen hála, megõrzött. Szombaton este a kimerültség és az izomláztól ágybazuhanva ringatás nélkül elaludtunk. Vasárnap reggel az áhítat után nem maradt más hátra a búcsúzkodás elõtt, csak hogy megünnepeljük a hétvége eredményeit egy közeli étteremben. - örülök, hogy nem kellett várni még négy hónapot egy ifitalálkozóra. Köszönjük mindazoknak, akik imádkoztak értünk és anyagilag is segítségül voltak nekünk. Olvasd el a teljes Bibliát az Interneten (angolul, King James Version)! TEREMTÉS VAGY FEJLÕDÉS (CREATION OR EVOLUTION)? A más web oldalakhoz ajánlott link-eket a szerkesztõ segítségként szánta, és nem felelõs azok tartalmáért, nem ért velük föltétlenül egyet. - The above Links are provided as a help to the browser and the Webmaster is not responsible for their content or views, nor should these Links be construed as an endorsement of the views contained therein. Az Ifjúsági oldalt Herjeczki Dávid tervezte és a grafikákat is õ készítette. Ha van ötleted vagy javaslatod, küldd el a webmasternek!